When it comes to classic, vintage looks, Hamilton seems to have a good handle on locking in that vintage, sometimes Americana, sort of a look. While the Hamilton Boulton is a little outside the style I’d normally be drawn to, there’s something about that art deco look that just speaks to me. So, we requested a loaner, and in one came. Now, unlike the previous Hamilton that we just reviewed, the Hamilton Boulton is a very compact watch. The stainless steel case comes in at 41.5mm lug to lug, and it’s just a hair over 8mm thick. What those dimensions hide is the curved caseback that it has. This makes for a watch that hugs in on the wrist very closely, making it wear even smaller than it might suggest. And, frankly, when you have a watch that’s much longer than it is wide, that’s a good route to go. This then leads us to the movement in the Hamilton Boulton. Sure, a mechanical can certainly be derived to fit into this sort of case, but that’s not what we have here. Instead, we have a quartz movement inside, and I think it’s a good decision for the watch. It may not be a piece that is worn every day, or it may be intended for someone who isn’t as “in” to watches as you and I. In both of those scenarios, and likely others, this makes the grab-and-go of a quartz a good option. With it’s more compact dimensions, polished steel case, and slightly glossy (and blue! yes, blue!) leather strap, this is one that feels a bit dressier. 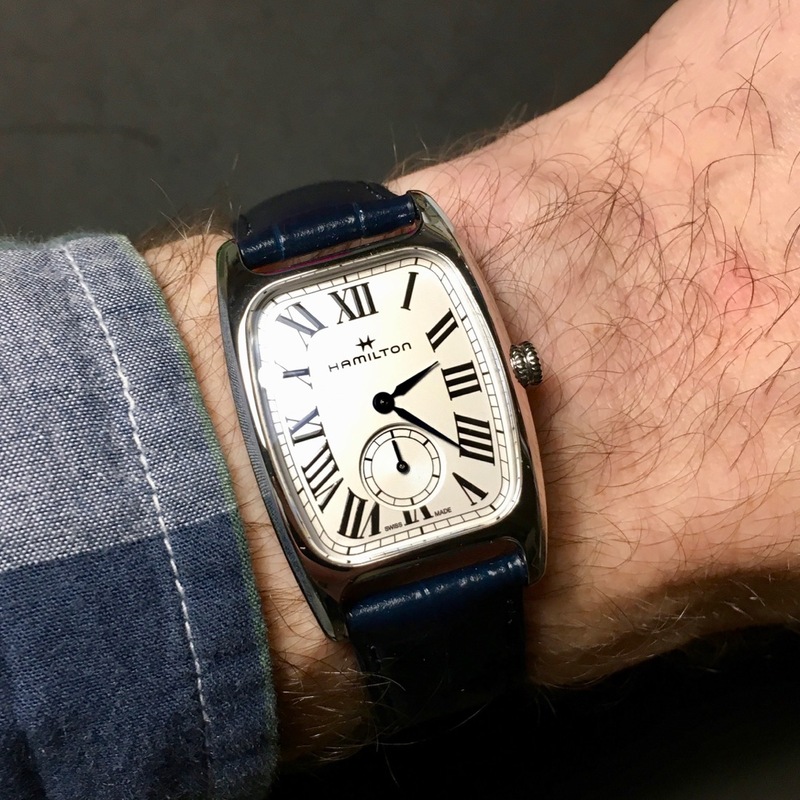 It was just on the borderline of being undersized for my wrist, but it fit nicely, and it also worked quite well on my wife’s wrist as well. Where this watch really shines is in the dial design. It’s classic and it’s super-legible. The Roman numerals almost look painted on (like a dial from the 40s would have been), and the blued hands stand out in sharp contrast. The sub seconds mix up the design a bit, with the recessed dial, and it makes for a rather nice look. The best thing about it: The dial and hands. For this watch, for me, it comes back to the dial and hands.